In South Africa, 47% of pregnant women and 34% of women after birth in low-income settings experience maternal depression. Despite the high prevalence, there is no state-provided programmatic response. Resolved to develop a meaningful response to this hidden crisis, a small group of midwives, volunteer counsellors and a medical doctor envisioned integrating mental health care for mothers at all points of entry in public sector services. In 2002, they designed and field-tested an on-site mental health care service integrated within the Liesbeeck Midwife Obstetric Unit at Mowbray Maternity Hospital. As demand and uptake of the mental health services increased, more volunteer counsellors were recruited into the service. In 2008, the Perinatal Mental Health Project (PMHP) was formally incorporated into the University of Cape Town. This relocation represented a formalization of PMHP operations and marked the beginning of the PMHP as a recognized, not‐for‐profit entity located within the Alan J Flisher Centre for Public Mental Health (CPMH) Department of Psychiatry and Mental Health. The PMHP team provides comprehensive mental health services at three different sites. It also operates a training programme for health and social workers across South Africa to enhance skills and knowledge with the aim of building sustained capacity to provide mental health support, screening and appropriate referral for pregnant and postpartum women and girls experiencing psychological distress. An important part of the training is strategy development for self-care for clinicians providing services. Furthermore, the project promotes the scale up of services and informs global interventions through a research programme and advocacy programme. From 2002 to 2014, the PMHP has screened approximately 26,000 pregnant women, counselled more than 4000 mothers in distress and provided over 11,000 individual counselling sessions. Two of these clients have shared their experience with the program. Prior to integrating a mental health service into maternity care settings, stakeholder engagement should adopt a participatory action approach and include relationship-building, mental health advocacy, mental health literacy and skills training for maternity staff. It is vital to address the mental wellbeing of staff themselves. Stakeholder relationships require on-going maintenance. A clinical service co-ordinator—who provides supervision, debriefing, and on-going support to counsellors—ensures the sustainability of quality mental health care provision. In low-resource settings, a brief, valid and easy to use screening tool is required. This tool, currently in development and pilot testing, will hopefully increase the acceptability and feasibility for regular, non-specialist staff to take on screening. 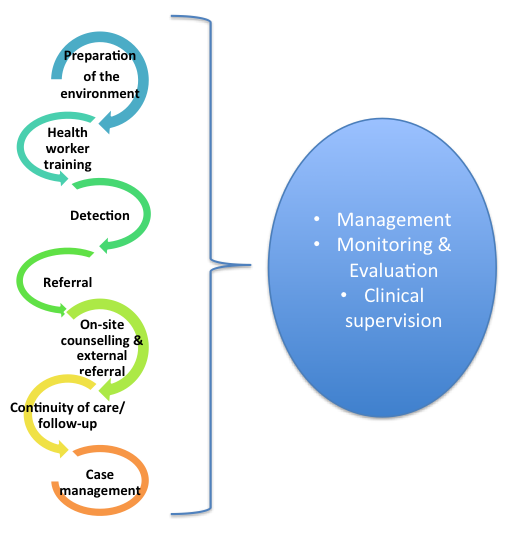 Routine integration of screening into history-taking procedures de-stigmatizes mental distress among providers and pregnant women. Carefully discussing referrals with clients optimizes service uptake. On-site mental health services increase access for women who have scarce resources and face competing health, family and economic priorities. An appointment and follow-up system can improve service uptake, continuity of care and reductions in rates of women lost to follow-up. In particular, scheduling counselling sessions to dovetail with routine service appointments may improve utilisation. As few as two counselling sessions appear to have a positive impact on symptoms of depression, anxiety and resolution of presenting problems. 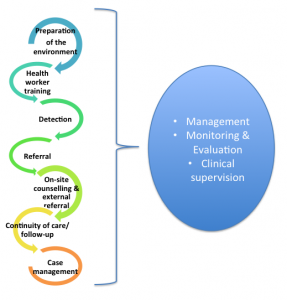 Counsellors must be equipped to provide case management, track and follow-up with patients as well as liaise with other facility staff, external social and specialist resources. M&E should be separated from clinical supervision of counsellors. M&E should be planned and standardized with the involvement of all staff involved in the service. Data should be analysed, translated and disseminated to stakeholders regularly. Troubleshooting should be a collaborative process. The PMHP has developed, implemented and evaluated a mental health service model for integration in to resource constrained primary care settings. The model design is based on principles of change management, collaborative care and sustainability.